It is finally here! From the Black Hills of South Dakota to the high plateau of Utah. From the Sierras in California to the Olympics in Washington, from the mesas of New Mexico to the mighty peaks of the Colorado Fourteeners, snow is falling across the country. If you think that your hiking days are over you are completely wrong. There is a whole new world of white waiting to be explored. All you need is your current hiking gear, appropriate clothing and boots, and snowshoes. Whether you want to trudge around the closed roads of your favorite park or take an extended hike deep into the woods, snowshoes can get you there quickly and effectively. You also gain the additional benefit of getting a tremendous aerobic workout, which will help you keep in shape for the coming spring. The first thing you need before hitting the trail is the right clothes. Dressing in layers is critical. As you heat up through physical activity you can open or shed layers to prevent sweat build up. Protecting your feet, hands, face, neck and head are extremely critical. Fifty percent of your heat loss is through your head. Improper clothing can lead to hypothermia or frostbite, and in extreme cases can cost you a limb, or even your life. Wearing the right layers also means being able to stay dry. Snow is frozen water, your body's warmth, sweat, and even your breath work against you creating moisture against your skin. Your first layers should be silk, Capilene or DryClime. Cotton should be avoided. If you are on a budget consider a wool blend if you can deal with being a little itchy. On the outer layer you should avoid letting moisture come through your protective layers. Gore-Tex is best, but if you can't afford it nylon or nylon blend that has been treated will do. If you're snowshoeing in the Mid-West or areas that are windy make sure your outer layer properly protects you form the heat robbing properties of the wind. The next thing you need to do is select a snowshoe. Snowshoes came in a wide variety of shapes and sizes depending on the conditions you will be experiencing. The most important factor is the, "float," the snowshoe you are considering provides. The float is what keeps you from sinking down into the snow, also known as postholing. If you're postholing, you're losing precious time, traction, and energy. Float is rated on most snowshoes in terms of total pounds the shoes can carry. This is a very important point, because the reference point is total pounds. If a snowshoe is rated for 225 pounds and you weigh 200 pounds, better make sure your gear and clothing doesn't push you over the top. In other words add up the total weight, including your cold weather gear and pack. If you plan to do backcountry camping, be especially careful to factor in the additional weight the heavier pack and gear will add. The snow you are trekking on has an effect too. Colorado champagne powder is going to require more float than the wet heavy snows of the Olympics and western Cascades. Another thing to consider when selecting snowshoes is the shape of the snowshoe itself. Rounded snowshoes will provide better float than tapered ones. However tapered ones are easier to walk in because you can maintain a natural stance, versus having to stand ever so slightly bowlegged. If you are large framed or heavy, look for more rounded shoes, the added float will be more important than the slightly awkward gait you will have to walk. When looking at snowshoes if you expect to find the wood and leather ones hanging on the wall as a decoration at your grandfather's hunting lodge, you are going to be in for a big surprise. Today's snowshoes are made with high tech components. Most are made out of durable plastics, aluminum and synthetic rubber. Some advanced models are made out of exotic materials including titanium, but be prepared to pay a lot of money. On the subject of money buying a pair of snowshoes is not cost prohibitive, even on a tight budget. High quality models that can carry 190 pounds can be found for under $200. Models that can carry 275 pounds can be found for under $250. It's even inexpensive to get the whole family involved, snowshoes for children can be found for under $50! 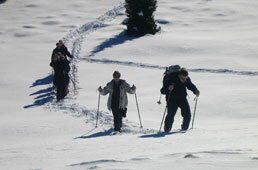 Learn more about snowshoeing NOW!